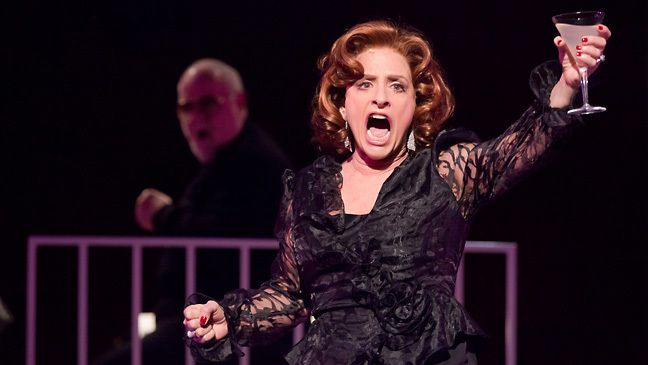 New York Philharmonic's 'Company' - Oh No They Didn't! 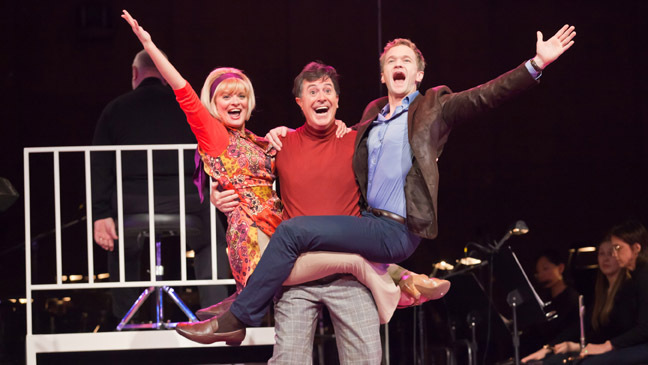 Martha Plimpton and Stephen Colbert play Sarah and Harry, married pals of Bobby (Neil Patrick Harris). 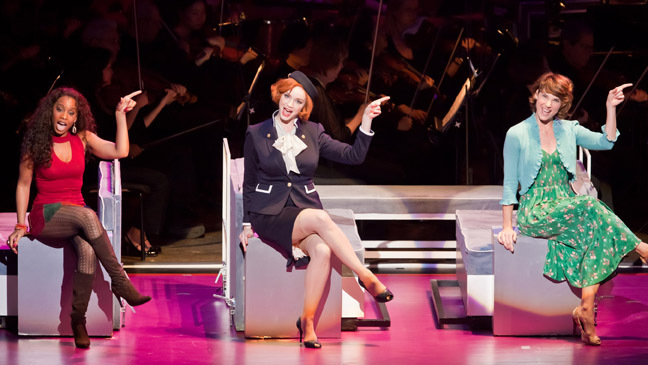 Anika Noni Rose, Christina Hendricks, and Chryssie Whitehead shine as the three girlfriends of the production's commitment-phobic protagonist Bobby (Neil Patrick Harris). 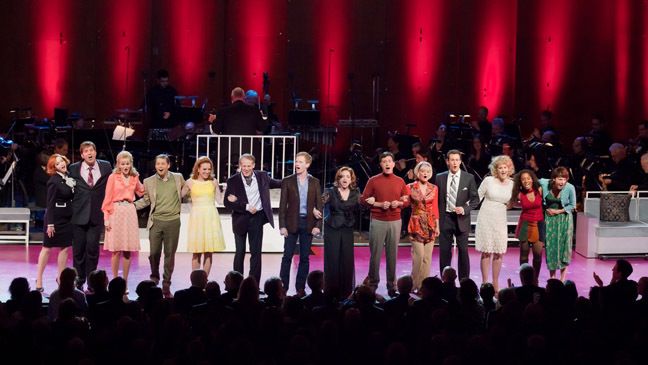 (Top row) Craig Bierko, Jill Paice, (middle row, from left) Christina Hendricks, Anika Noni Rose, Chryssie Whitehead, Jim Walton, Martha Plimpton, Jennifer Laura Thompson, Jon Cryer, (bottom row, from left) Stephen Colbert, Patti LuPone, Neil Patrick Harris, Katie Finneran, Aaron Lazar. In his review, THR's David Rooney says "Plimpton and Colbert make an inspired comedy team; their depiction of marriage as a no-holds-barred contact sport is hilarious." 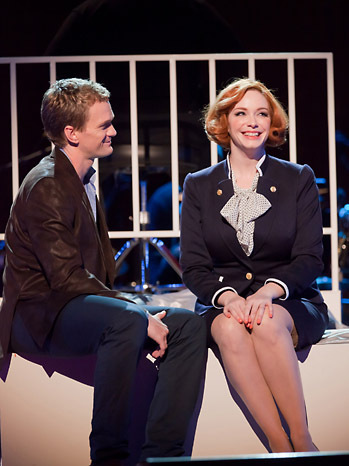 As a bubbly fight attendant who falls for Bobby (Neil Patrick Harris), Christina Hendricks "has a lovely stage presence and delicious timing," THR's David Rooney says in his review. "Playing dumb with dignity, she gives Bobby’s self-deprecating girlfriend an airy sweetness that recalls Marilyn Monroe." 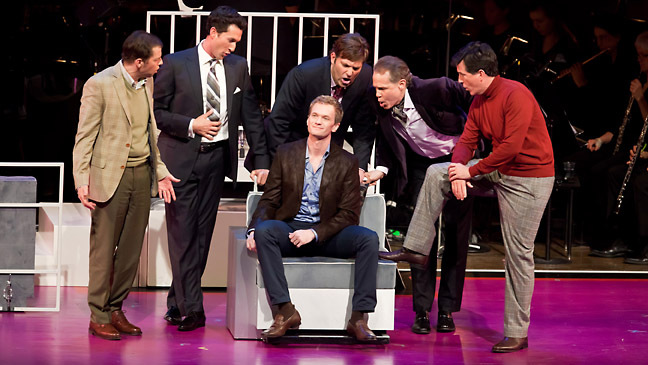 In one scene, Neil Patrick Harris' character Bobby huddled with his friends - (l. to r.) Jon Cryer, Aaron Lazar, Craig Bierko, Jim Walton and Stephen Colbert - as they tried to find him a romantic match. I agree! I only clicked because I spotted a token black person, but I'm glad I clicked. My friend is seeing this this weekend and I hate him so much rn. Being in Australia is the worst. Egads this looks amazing! Stephen Colbert and Martha Plimpton playing a married couple alone would be worth the price of admission for me. You continue to have amazing taste. I would like to be part of the NPH and CH sandwich. Just scrolling by, from that far-away picture, I spotted Stephen in his turtleneck, having no idea he was in this production. NPH as bobby? no thank you. Jon Cryer and NPH? ew no thanks. So many people I love! Amazing. I just don't know where to begin. 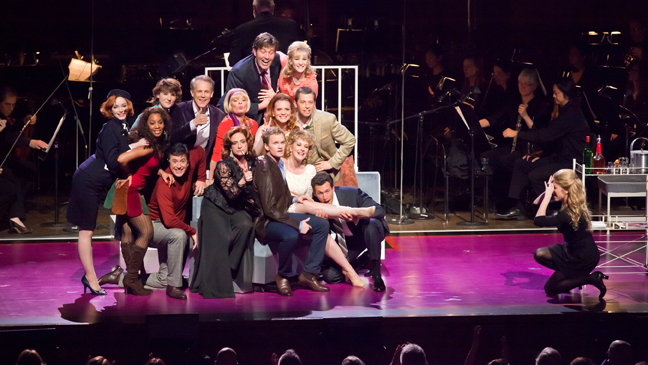 This cast and Company itself are flawless. I NEED VIDEOS!!!! Sooooo remarkably bummed I didn't buy a ticket to this when the $90 ones were still available. I've become completely obsessed with the soundtrack since I found out about this and it would have been amazing to see live. That said, it's apparently being filmed and will be screened in theaters in June and I absolutely want to vomit from joy. I NEED TO HEAR STEPHEN SING "SORRY-GRATEFUL" IN ORDER FOR MY LIFE TO HAVE MEANING, GAAAAAH. I think I would sacrifice a small child to see this live. Oh man, I want to see this. DAMMIT. Seeing Colbert and NPH in a musical live would make my life so incredible. And now I want to go watch Anna Kendrick sing "Ladies Who Lunch." Oh, Camp. Omg I hope they release an official recording of this. D: I'd kill to hear NPH as Robert! And Patti as Joanne! Amazing cast though, can't wait for it to be released in theaters. martha plimpton is so awesome.